We’ve been on the road a bit, and busy with family things, and in the studio working on new art for upcoming shows … and this blog has been a bit neglected. To tide you over until the next time there’s a snow globe ready for its close-up, here’s a wonderful story from one of our local newspapers, “Life on Capitol Hill” in Denver. Snow falls outside the window of Hilltop residents Cameron Lewis and Reid Grossnickle’s workshop. But there’s a bit of snow inside, too, in the confetti and glitter swirling in the collection of snow globes — some now decades old with yellowing water — that line shelves in the entrance of the pair’s packed workshop. Many of the globes celebrated milestones of corporate companies, some no longer in existence. Making snow globes was a career that unexpectedly landed in Grossnickle’s lap. He and Lewis originally made cubes with liquid and sculptures inside. The pair were at an art show in Las Vegas in the ‘90s when someone asked if the art could be set in globes instead. So Grossnickle began making snow globes for companies. Lewis later explored the couple’s more artistic side with globes for art shows as well as their Etsy shop. together the pieces and Grossnickle creating the “snow” inside. The magic happens at the back of the couple’s workshop in northeast Denver. Grossnickle helps repair snow globes sent to the workshop, many of them collectibles or items with special family memories. But he also makes snow globes with people’s photos and for companies or universities that want bulk orders with each one looking exactly the same. 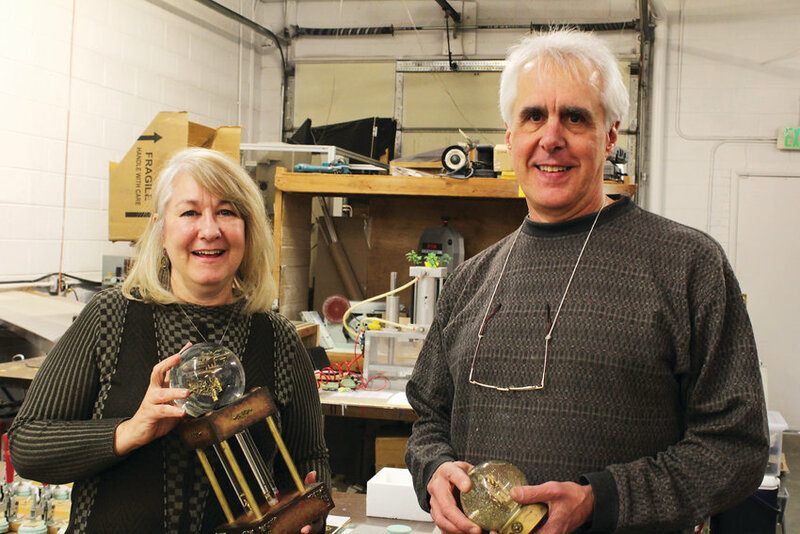 He is one of the few snow-globe makers in the U.S. making corporate products, Grossnickle said. Other companies are based in China and Taiwan. The pair don’t advertise or promote repairs on their website, but if people ask, Grossnickle will often take in customer’s broken globes. After repairing his first globe for a family who lost their mother to cancer, he couldn’t say no. “When I fixed the one, Pandora’s Box got open, and the flood has just come in,” he said. Lewis is in charge of the handmade creations — snow globes large and small inspired by trinkets or other objects she finds. She often stops on walks, picking up plastic pieces or items people consider trash. “We still get inspired by what we experience,” she said. Each globe contains its own little world. As a former architect, Grossnickle sometimes makes model stairs or other items to go in the globes. The largest ones are 5 inches in diameter. Often, Lewis sets those globes on stands that have vertical liquid tubes with glitter and confetti. The couple moved their workshop to northeast Denver after getting priced out of the River North neighborhood, where they worked for 30 years, they said. The workshop houses all the glitter and confetti for the globes, as well as the liquid solutions and glass. 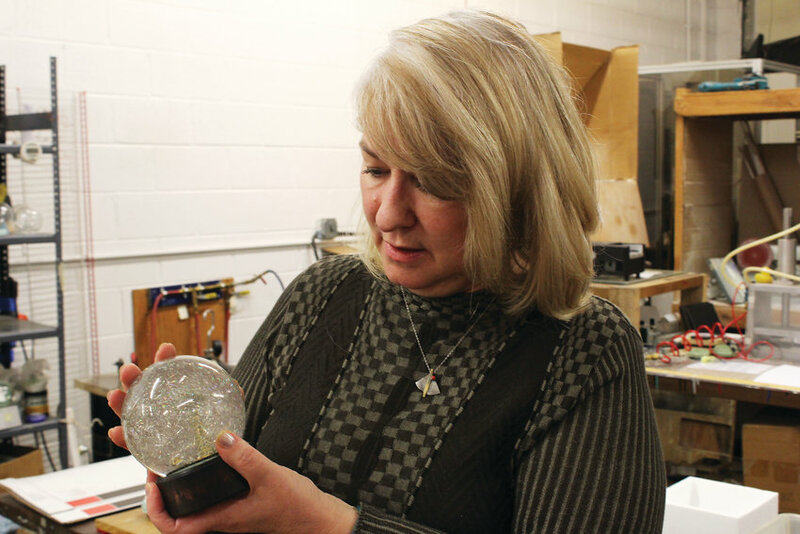 Creating snow globes can be as much a science as an art because of all the steps to ensure the confetti works in the liquid solution, Lewis said. Although Lewis handles the business side of the artistic snow globes, making them is a collaborative effort. Once she finishes the sculpture on the inside, she passes it along to Grossnickle who picks out the color of the confetti. Some items float differently in the liquid, she added, and can take hours to descend to the bottom again. sure they work well in the liquid solution. Completing a snow globe can take several months of careful and concentrated work. Cameron Lewis said that she and Reid Grossnickle try to show their snow globes in art festivals around the country. But their artistic snow globes are not something that can be shipped. Instead, the couple gently packs up the globes and drives to shows across the country. Lewis said she and Grossnickle will be in the Cherry Creeks Arts Festival again this year, which will be happening July 5-7. For more information, go to http://cherrycreekartsfestival.org/. The couple’s festival schedule can be found on their website, https://camrynforrest.com/. When they’re not traveling to shows, Cameron Lewis and Reid Grossnickle sell their snow globes on their Etsy shop, CamrynForrestDesigns. More information can also be found on their website, https://camrynforrest.com/. Grossnickle’s site for custom snow globes and repairs is www.snowglobecentral.com. When it comes to repairs and corporate snow globes, having the right glitter or confetti can make all the difference. Lewis said that when confetti companies started going out of business, she and Grossnickle would buy their inventory. This led to them owning tens of pounds of glitter. “We have more confetti than Party City does,” she said. But it’s worth it. When Grossnickle gets requests for repairs, even the smallest sample of the gitter inside the snow globe can help. “When someone sends in a globe, there’s a really good chance that we’re going to be able to match what was in it,” Lewis said. Haven’t you ever wanted to let someone else make all the decisions, or let something decide for you? Climb into a balloon, rise into the sky, and let the wind carry you to places you can only imagine. But you aren’t an innocent bystander taken for a ride. You decided this: to let go, to let the wind blow, to decide not to decide. “Where the Wind Blows” – miniature hot air balloon sculpture over tiny rooftops. When shaken, the liquid sky fills with mystic fog — iridescent sparkles and shimmering reflective dust. Wooden base with hand-painted metallic patina and compass detailing on four sides. One of a kind sparkle snow globe, all photos and designs are copyright (c) 2018 Camryn Forrest Designs, Denver, Colorado, USA. It takes a village to tame a wild rainbow, with persistence and dedication. Working slowly, so as not to frighten the tangle of colors, the group moves in unison, both distracting and disarming. Charmed and enchanted, the arching colors stretch and slide into place, tamed temporarily, ready again to burst into vibrant light. Taming The Wild Rainbow, sculpture of miniature figures, prismatic beads and filament. When shaken, the liquid shimmers with reflective, prismatic dust, adding to the rainbow effect. Handpainted wooden base with soft sky and cloud imagery. All photos, images and designs are copyright (c) 2018 Camryn Forrest Designs, Denver, Colorado USA. When we were young, we thought about all the things we’d do when we got big. And now, we think about growing older and all the things we want to see and do while we can. There is still so much to see! So much to do! So many adventures yet to write. For all those sidekicks we’ve known, and all those we’ve yet to meet, we invite you: Stay Young With Me. “Stay Young With Me” original sparkle snow globe by Camryn Forrest Designs. A tiny tree sports a moving rope swing, where two people are defying gravity and making their own breeze. Wood base with engraved plate and tiny bronze leaf embellishments. Shake the globe and listen: You can hear their laughter on the wind. All designs and photos are copyright (c) Camryn Forrest Designs, Denver, Colorado.